Marc Levers scored the first Phantoms goal. 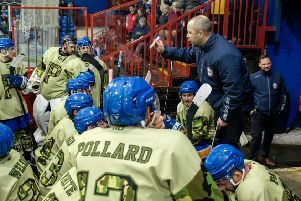 Peterborough Phantoms coach Slava Koulikov declared the club’s English Premier League Cup semi-final first leg mission a success last night (January 13) - even though they were unable to end their Milton Keynes hoodoo. The city team shared six goals in a thrilling derby clash on Lightning ice in Buckinghamshire to leave the tie in the balance ahead of a return at Planet Ice next Wednesday (January 20). Phantoms saw a two-goal advantage turn into a 3-2 deficit before restoring parity within 90 seconds of falling behind, but it was a sixth game against their fiercest rivals without victory this season. Koulikov said: “Our objective in the first leg was to make sure we were still in with a chance of getting through to the final. “We have certainly done that in a game where both teams played some pretty decent hockey. “You never want to lose a lead, but we couldn’t say we were dominant when we were ahead as MK were always creating chances. “The way we responded to going behind really pleased me and that could prove to be a huge goal in the tie. Marc Levers fired Phantoms into the lead in the opening period and the advantage was doubled by Tom Norton early in the second session. But their cushion was wiped out by two goals in under two minutes from the hosts. Leigh Jamieson thumped in the first of them on a powerplay before Grant Billing levelled, and the turnaround was completed 46 seconds into the final period by import star Frantisek Bakrlik. But Phantoms weren’t in arrears for long as Will Weldon hauled them level to set up a mouth-watering second leg. Milton Keynes – James Griffin.